InvisibleSHIELD is one of the most well-known screen protector manufacturers. The military grade patented material used by InvisibleSHIELD is quite possibly its biggest selling point. Moreover, unlike most other screen protectors, InvisibleSHIELD also offers full body protection. My roommate Chinmoy Kanjilal graciously agreed test a review unit (sent by Mobilefun.co.uk) on his HTC Legend. InvisibleSHIELD’s packaging is impressive and includes everything from adhesive and spray to squeezy (to squeeze out bubbles). However, applying InvisibleSHIELD turned out to be a lot tougher than expected and took around about an hour. Fitting the screen protector around edges demands some dexterity. The supplied manual is helpful, but anyone who purchases an InvisibleSHIELD should have a look at the video embedded below before getting started. After application, the InvisibleSHIELD took about half a day to heal. Although the screen protector is extremely tough, it is still thin enough to be comfortable to use. Unlike some of the other screen protectors, there was no perceivable loss of sensitivity with the InvisibleSHIELD. However, the surface has a rather plasticky feel to it (i.e. it lacks texture) that I don’t like. I have been using Martin Fields screen protector on my Xperia X10 for the past couple of months. After testing both, I would have to say that I am more impressed with Martin Fields. InvisibleSHIELD is undoubtedly more durable; the MF screen protector has already acquired quite a few scratches. However, it is a real hassle to install and feels less satisfying to use. It’s not a bad product by any means. All of the materials included are of high quality. Importantly enough, InvisibleSHIELD is reusable and the adhesive doesn’t leave any mark on the handset after removal. In fact, if you want full body protection and don’t want to use a screen cover that spoils the beauty of your handset, InvisibleSHIELD is your best option. 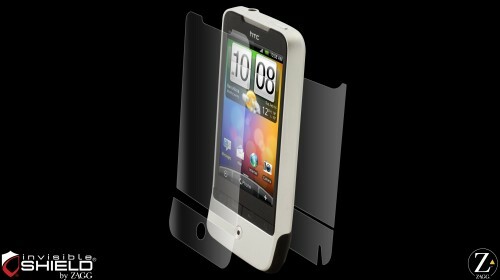 If you want a HTC Legend cover or screen protector head over to Mobilefun.co.uk. @Shaunak De: I used GadgetShieldz which I got from gadgetshieldz.com and it does not have any issues with the phone’s sensitivity. I am able to use my iPhone perfectly with the skin on it. I think you should give it a try if you want to know how it really feels. It would just cost you $6.99 with free worldwide delivery so you don’t have to worry about the money you spend on it. Its really Awesome. thanks for sharing the information.i like it very much. Actually I don’t like screen protectors either, but it doesn’t matter since the protection they provide for the screen is really necessary and without them after a while the phone looks old and used. The InvisibleSHIELD should looks pretty good, glad to hear that there won’t be any after effects when you remove it, that certainly makes it worth while to get the InvisibleSHIELD so you can increase the value of your item when you go to resale it! InvisibleSHIELD products are branded and high quality compare to those made in China. It could cost quite a lot but it worth it if you want guaranteed protection for your phone. Screen protectors do save our screens from scratch but at the other hand touch screens loose sensitivity. Custom complaint that, they need to push hard at screen, in order to work fast. I didn’t realize they had something like that out. I have an LG Touch, would it work for that. I have ordered it. Lets see how it goes. Screen protectors has to be more sensitive in order to transfer human touch from it’s surface to cell screen. This InvisibleSHIELD looks cool. But do they have these for other phones such as iPhone? screen protectors has to be more sensitive in order to transfer human touch from itâ€™s surface to cell screen. Actually I donâ€™t like screen protectors either, but it doesnâ€™t matter since the protection they provide for the screen is really necessary and without them after a while the phone looks old and used. Using screen protector from one end is beneficial because it save screen from dirt and unwanted scratch. Rightly it is dexterity matter to fit the screen protector exactly by keeping edges in consideration. There is touch sensitivity problem remains with screen protector in touch screen phones. But if there is quality screen protector, i don’t think there will be high touch sensitivity problem.